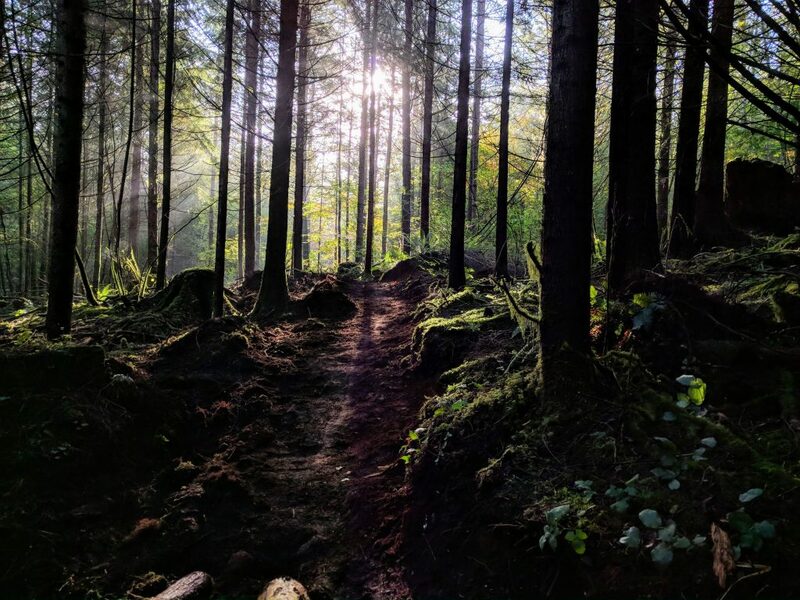 The Fraser Valley Regional District (FVRD) & Fraser Valley Mountain Bikers Association (FVMBA) partnered with the International Mountain Bike Association Canada (IMBA Canada) on the Experience the Fraser Project (ETF) doing a Job-Creation Partnership Program (JCP). Phew, that is a mouthful. Now, with that out of the way – what does it all mean? 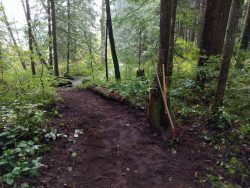 The quick version – we finished up the final leg of a multi-year project building brand-new singletrack in the Stave West Interpretive Forest in Mission and Rolley Lake Provincial Park. 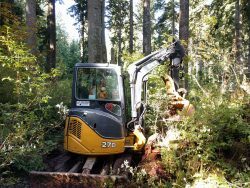 For 4+ years now, FVMBA builders have been working with the FVRD to build the leg of the ETF trail that goes from the Woodlot 0007 to Rolley Lake and back down to Stave Lake. 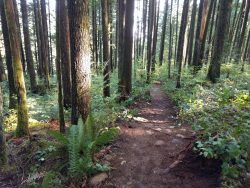 The FVRD came to the FVMBA at the time seeking our trail builder’s expertise in teaching the JCP participants how to build solid trail. The JCP program in a nutshell is a program that works to fund community projects while employing people that are currently enrolled on EI to learn new skills for potential new career paths. 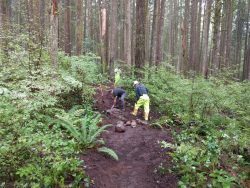 Initially the trail builders did this on their own as independent contractors (hat tip to Eugene, Prorok & Ian for the first couple years of work), but this latest and last iteration of the project had the club take the lead and work closely with the FVRD to execute a truly transformative project. The trail is pretty cool – don’t get me wrong, it’s nice and all. But the outcomes are what really excite me for this project, and the future. 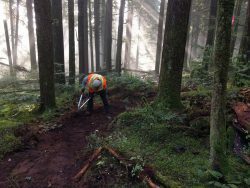 We recruited IMBA to run a 2-day trail training program to train our build supervisors, the JCP crew, FVRD staff, BC Parks Staff, and we extended the invitation to all our partner municipalities to send Parks staff to learn how to build sweet singletrack. Chilliwack and Mission both sent staff to learn the ropes. 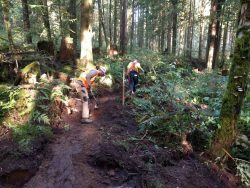 The 2-day program saw a classic and sustainable re-alignment, restoration and braid closure of 250m of trail on the west end of Rolley Lake. After that, our build supervisors from Maple Ridge (Ryan & Paul), Mission (Eugene, Frank & Rocky), and Abbotsford (Chris) all worked with the JCP Crew (Rod & Stacey) to finish the restoration of the rest of Rolley Polley and then work another week building a new section of machine-built trail from the Rolley Falls Trail connecting to Curved Cuts. These trail names are placeholders BTW – we have plans to work with all stakeholders in the Stave West area to come up with a trail master plan including trail names that are better connected to the heritage and future of the developing recreation playground. Our builders got some machine trigger time to make trail but also to continue to learn better ways to build it. In talking to other communities around the Province, it’s pretty unique to get that many stakeholders at a table and pull together to achieve a project like this. It is small in scale (2km of trail) but it is big in impact. I’d like to express a very big thank you to David Urban @ FVRD and his team for the work they did to pull this all together. 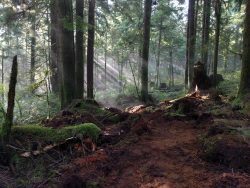 We also had discussions with BC Parks about MTB Trail development in Golden Ears PP. That is all I can tell you about that one – but there are exciting things happening!! Just wanted to take the time to share one of the many things we’ve been up to lately that I’m pretty proud of. Working hard for the trails and your community.